Orkney legend tells of a weird and horrible creature called the Stoor Worm hatched by an evil spirit and set in the oceans deep to wreak havoc on sailors and island folk. Considered one of the nine plagues of humankind the Stoor Worm with a giant gapping mouth, deadly forked tongue, and poison breath was a destroyer of ships, cities, castles, and honorable women. One day the monster settled in on the shore of an ancient seafaring kingdom. From then on, every Saturday, with the cracking of the sun, the great worm would yawn nine times and gobble down seven virgins to appease its need for a balanced breakfast. This ritual happened week after week. The people put up with it until they started running low on virgins. Dismayed the leaders of this kingdom sought the advice of a resident wizard. He told them that the king’s daughter would be the only meal that would truly appease the mighty worm and until that meal was satisfied, the terror would not leave their shores. Needless to say, the king, who loved his only daughter, was not overly impressed with the wizard’s advice. His nobles, however, who had been losing money since the Stoor Worm came to town, were all for it. Well, the king, being the king got a ten-day reprieve to come up with a better plan. He sent messengers far and wide seeking a hero to stop the monster. As reward the king offered his kingdom and the hand of his daughter in marriage. 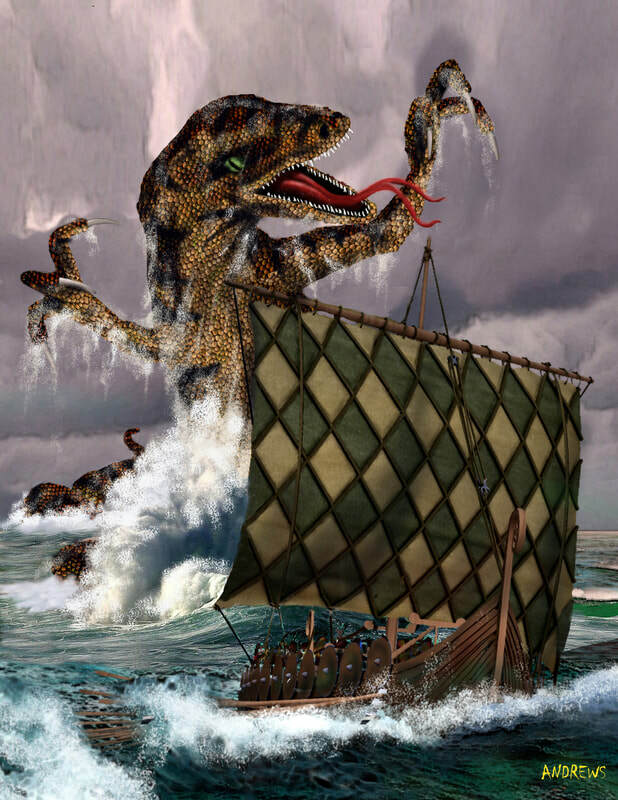 As a bonus, the warrior willing to face this city-gobbling, ship-swallowing, devourer of virgins could use the king’s own sword Sikkersnapper, which was a gift from none other than Odin himself. Countless warriors answered to the heroes call. They got one good look at the giant worm turned and headed home. Of all that came, only twelve stayed to make a valiant stand against the sea monster. They were, as one, wolfed down by the Stoor Worm like bag of M&Ms. Needless to say, the king, his daughter, and the people despaired. On the tenth day, a farm boy and devoted day dreamer named Assipattle arrived. The youngest and least likely to lift a finger of seven sons, Assipattle preferred sitting by the peat fire making up stories about how great he was or could be rather than tending to his chores. His daydreaming and wild stories of self-promotion were always rewarded with beatings from each of his brothers. Deciding it was time to prove his claims to greatness, Assipattle snuck off the farm taking his father’s boat and a basket filled with smoldering peat. He rowed all the way to the mouth of the still sleeping leviathan in his wee skid. Settling his boat up next to the sea monster’s mouth, Assipattle waited for dawn and the yawn. As the sun broke free of the horizon, the great worm began to stir. It opened its huge gob and began its nine yawns before breakfast. Each time the Stoor Worm yawned great waves of water would wash down its throat. Assipattle in his skid rode one of these waves deep into the monster’s gullet. The farm boy hung on for a wild ride whipping round and round, following the twisting and turning curves of the worm’s long squirming body. The daydreamer rode that wild current all the way down deep, deep into the worm’s innards. When his boat finally settled, the lad leaped from it grabbing his smoldering peat and made for the monster’s liver. He arrived at his target, took out his dirk, and cut a hole into the organ. He then stuffed the still-smoldering peat into the hole and blew on it until a blaze started. The water drape’s liver lit up like it was soaked in whisky and burned wildly out of control. Assipattle, happy with his deed done, ran quick for the wee skid and held on for life and limb. The burning liver made the sea monster retch horribly. Then the same swallow of water that sent the lad in the beast took him out. After another wild twisting ride, Assipattle and the skid came shooting from the giant’s gapping mouth. So much pressure was behind that creature’s retch, it shot boy and boat across the open sea and to shore again. With smoke bellowing out of more orifices than the monster cared for, it groaned in agony. Reaching with its giant tongue, it leaped for the moon. The forked tongue latched on to one of the moon’s horns and there the monster clung for a moment. The tongue slipped its grip and down, down the Stoor Worm fell. When it hit the earth again, the dent of the impact in the ground created the Baltic Sea. Still bellowing smoke from indigestion due to a flaming liver, the great worm thrashed on violently. Each time its mammoth head smashed back onto the earth teeth fell from its gapping smoke-filled gob. Those teeth dropped to earth and became the Orkney, Shetland, and Faroe Islands. With its final death throes, the great Stoor Worm coiled up and called it quits. Its body solidified becoming Iceland. Within a week, Assipattle was wed to the king’s daughter, named the king’s favorite son, gained a kingdom, had his brothers beat for good measure, and all the people rejoiced.